Every alcoholic is different, from their reasons for drinking to their methods of trying to cope with life as they drink. Because of this, how you treat an alcoholic must change according to circumstances. There are certain types of alcoholics and knowing about the various types can help you deal with individual situations more easily. “Every alcoholic is different, from their reasons for drinking to their methods of trying to cope with life as they drink.” -Projectknow.com While no individual is likely to fit perfectly into a category type, learning more about your loved one’s specific situation can help you and rehab workers in their efforts to provide the alcoholic with the support he or she needs to live a clean and sober lifestyle. The first of the five types of alcoholics is the young adult subtype. This grouping is the largest one, consisting of 32 percent of the alcoholics in the United States. The average age of the alcoholics in this category is 24. Though young, the average alcoholic in this group at 24 has already spent the last four years as an alcoholic, having become one at the average age of 20. Many members of this group also have family members who are alcoholics, at a rate of 22 percent. For this group, alcoholism isn’t about drinking heavily on a daily basis. Instead, members of this group tend to binge drink, making up in quantity at a single sitting what other alcoholic types imbibe throughout the process of a day. Alcoholics in this group rarely seek help for their drinking. “…these types of drinkers began drinking much earlier.” -Projectknow.com This second category in the types of alcoholics is also a large one, accounting for 21 percent of the total alcoholics in the study. The average age of members of this group is 26 years old, but unlike the young adult, these types of drinkers began drinking much earlier, starting at 15 and developing alcoholism by the age of 18. Half of this group has family members who are alcoholics. Half also have an antisocial disorder, making it difficult for them to seek or accept help for alcoholism. Members of this group also have an increased likelihood of drug use, especially of marijuana, cocaine and opioids. Eventually, 33 percent of this group’s members will look for help in recovering from their alcoholism. Functional alcoholics make up the third category in the different types of alcoholics. A functional alcoholic is one who drinks on a daily basis, usually ingesting at least five drinks throughout a single day. The average age is much older than the other groups, and most members are middle-aged. They’re considered functional because, despite their excessive drinking, they still manage to maintain relationships and hold down a job. This group comprises about 19 percent of all alcoholics. Although members of this group continue to function in society while drinking, functional alcoholics still have the same medical issues as other alcoholics due to their high volume of drinking. 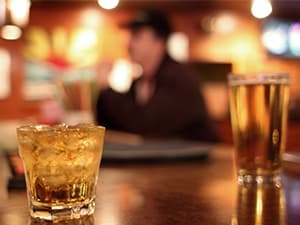 About 19 percent of functional alcoholics end up getting help. Accounting for 19 percent of the alcoholics in the study, the intermediate familial is the fourth category in the types of alcoholics. These alcoholics begin young like the young antisocial, with most starting to drink by the age of 17. Alcoholism doesn’t become a problem in their lives until they reach their early 30s. Almost half of the members of this subgroup are closely related to other alcoholics. Half have also experienced severe depression, and a quarter of the group’s members are diagnosed as bipolar. There’s some drug use within this group as well, with marijuana or cocaine abused by many of the group’s members. Eventually, about 25 percent of the members of this group will seek help for their alcoholism. Chronic severe alcoholic is the final alcoholic category. These alcoholics are rare to encounter, making up about 9 percent of the total. In this group, you’ll find mostly men with a higher than average divorce rate. The majority of the group are from families with alcoholism. Nearly half have been diagnosed with a personality disorder, and the rates of other mental illnesses are higher than in any other group as well. This group also includes those drinkers with severe drug abuse issues. Despite these issues, these types of drinkers in this group are the most likely to get help, with over 66 percent eventually seeking aid. According to the Collaborative Study on the Genetics of Alcoholism, a child of an alcoholic parent is four to nine times more likely to become an alcoholic than a child without an alcoholic parent. In 2008, alcohol was related in some way to 31 percent of traffic accidents. After determining the group of types of alcoholics that an individual belongs to, it’s possible to better tailor the therapy used for rehabilitation. According to the U.S. Department of Health and Human Services, 48.3 percent of Americans over the age of 12 are drinkers. That number includes a large number of alcoholics, and categorizing types of alcoholics is just one tool that can help that large number get the help they need. Call 1-888-287-0471	Who Answers? to find out more about alcoholism recovery.